Nine people have been killed in clashes between rival unions at a South African mine owned by leading platinum producer Lonmin, police have said. The dead included two policemen attacked by a mob, and three workers killed by officers, at the mine in North West province, police said. The violence is linked to a battle for membership between a new and a long-established trade union. South Africa has most one of the most unionized work forces in the world. It is also the world’s biggest platinum producer, accounting for three quarters of global output. There has been a surge in inter-union violence at mines recently. Earlier this month, another firm, Aquarius Platinum, briefly shut one of its shafts after an attack that left three dead and at least 20 injured, Reuters news agency reports. Police spokesman Brigadier Thulani Ngubane said the attackers were deploying “guerrilla tactics”, rapidly forming crowds to carry out attacks – in 5,000-strong mobs – before dispersing. Lonmin said the situation was “volatile” at its Western Platinum mine, 100 km (60 miles) north-west of Johannesburg. The plant was operating at reduced capacity and was under heavy police guard, it added. Police spokesman Brigadier Lindela Mashigo said the two policemen were killed after a mob attacked them near the mine with machetes, Reuters reports. Police responded by opening fire, killing three protesters, he said. “We came under attack. The suspects took our weapons. A shoot-out ensued and during that incident three suspects were fatally injured,” the spokesman said. The violence has been triggered by a turf war between the long-established National Union of Mineworkers (NUM) and a newcomer, the Association of Mineworkers and Construction Union (AMCU), which is more militant, analysts say. 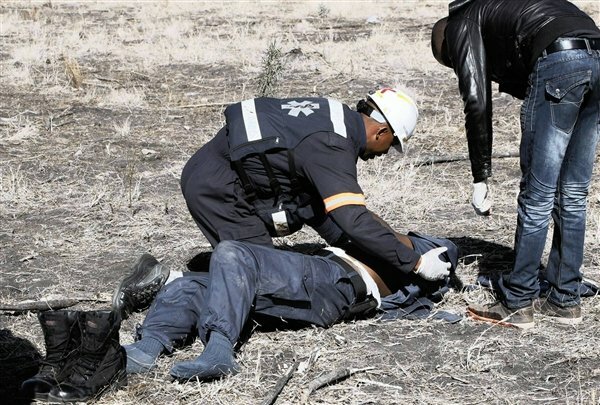 In other cases of union violence at Western Platinum mine, two security guards were hacked to death on Sunday and another two had recently been burnt to death, said Brigadier Thulani Ngubane. At least three people were killed in a similar round of violence in January that led to a six-week closure of the world’s largest platinum mine, run by Impala Platinum, Reuters reports.